Fully charged and ready for battle! Power up moments is an integral part of gaming. 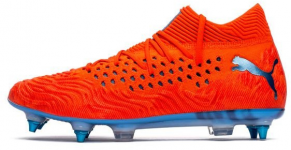 These allow a player to recharge or achieve special skills, even immortality. 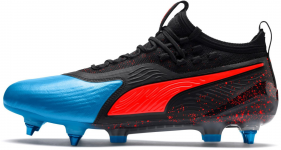 PUMA players need to special inventory or external help, to reach next level. 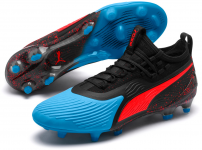 With the PUMA Power Up Pack you’ll be the main player, in your own game - battling for glory and max points. The colors are inspired by the classic arcade games, with fire-red and ice-blue being dominant. Power Up, get ready and stay focused! Get the PUMA Power Up Pack! Crafted from soft and flexible kangaroo leather, providing superior comfort fit and durability. All without compromising on the outstanding level of control. Featuring the innovative fusefit tech, that allows for an individual lacing in an awesome design. evoKNIT sock for optimum fit and stability, with pull tabs for easy entry. Outsole featuring RAPIDAGILITY tech, reducing the weight. This allows you to reach even higher speed, while ensuring the needed stability. Stud configuration for faster acceleration, outperforming your opponents.